Agate Morter and Pestal sets are useful when low contaminated grinding is required. Desired results can be obtained using these equipments. These are available in custom sizes and posses great strength. We take care of clients needs and requirements as well. Our rates are best in the market and quality is given utmost importance. 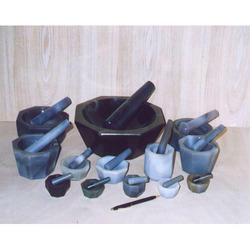 We are leading superior quality of Agate Mortar and Pestle Set. Abrasive materials can be used in Acid. Processing of imported Raw Materials used are made with pure volume. The number one purpose of any Mortar and Pestle Set is to grind solids into fine powders but under conditions that are highly controlled as to not produce any heating effects and to minimize and control any effects due to stretching of sometimes deformable materials. This is probably the most ancient device one is likely to find in a modern scientific laboratory or kitchen. From a cross-contamination and cleanliness (hygiene) standpoint if in the kitchen, the high density Agate is far more desirable than the more porous porcelain which could grow bacteria in the pores and present a health problem. If a Mortar and Pestle of metal construction is used, it is generally recognized that metal particles enter the ground powder, thereby presenting either a health concern or else a contaminant is precision scientific measurements are to be made on the ground powder. We know that some customers have needs to do the grinding either at elevated temperatures or at low (cryogenic) temperatures. Because of thermal expansion (or contraction) effects, we cannot guarantee the Mortar and Pestle Sets against breakage when used under such conditions. Looking for Agate Morter and Pestal Set ?